Welcome to the Achievement Finance website. We're mortgage brokers located in Perth, Western Australia. We've been in the finance industry since 2002, so it's safe to say we've had more than enough experience when it comes to dealing with lenders. At Achievement Finance, we have had the opportunity to build strong relationships with a wide variety of lenders - some of whom you may not even know about! So what does that mean for you? It means we are here to help you get the best loan possible. Whether you are looking to buy your first home or third home, looking to renovate, refinance or invest, we're here to help you through the process and negotiate the right finance for you. Achievement Finance has hundreds of loan options available from across Australia's leading lenders and we'll work with you to find the right finance solution to meet your needs. We'll help navigate you through the competitive and ever-changing mortgage landscape to find the right loan for you. We're here to negotiate on your behalf, and we'll make the process as simple as possible for you. We'll help you avoid the pitfalls, and we'll find loan features to suit your personal circumstances. So what is your alternative? The alternative to working with a broker is to do it all yourself. That means 'shopping around' and researching dozens of lenders to compare their mortgage terms and rates. However, working with a broker saves you the time and headache of having to do it all on your own. A broker can also steer you away from certain lenders with stringent payment terms that may be buried in their mortgage contracts. We love what we do and we are confident we can help with all your finance needs! Please take some time to look around, and take advantage of the clever tools on our site such as our calculators, our finance guides and tips, and the latest updates in our newsletter. We look forward to working with you. We found Terry's advice at all points of the process both informative and accurate. He was direct when he needed to be and that we found very helpful as our transaction was particularly political at times and very emotional. He remained focused on the end goal with each step and was never too far away from the phone when we needed to discuss a point or two. He is very professional in the way he conducted his work with us and at the same time had a very personable approach we found refreshing . We would have absolutely great confidence in recommending Terry's services to anyone of our friends and business colleagues in the future. The service provided by Lucy and Terry made applying for my first mortgage a lot less daunting and instead made the experience fulfilling and carefree as I didn't have to worry at any stage due to their excellent and friendly communication, always available to answer any silly questions I might have had. Lucia and Terry Monastra listened to my property purchasing needs and investment goals and provided a clear path to accessing the finance I needed to make my investments happen. Lucy took care of our every need, even when there was a small problem with the bank, she sorted it out quickly with no stress. A lovely lady. Both Lucy and Terry were very efficient and attentive throughout the loan process. There was never a call or email that was not returned in a very timely manner, they are really lovely to deal with at all times, during and even after everything was finalised. Not once did I feel forgotten by them, they always kept me up-to-date and I never felt confused by what was happening, as their knowledge is second to none! They are personable and professional. I still rave how wonderful they made our loan experience, especially after having two terrible experiences with other brokers. Turn right onto Alvan before Subiaco Cinemas. Turn right onto Outridge Crescent. Turn left at end of street, up carpark ramp. Turn right onto Alvan St (1st right after Centro Ave/Roberts Rd Intersection). Turn right into Railway Rd. Turn right into Outridge Crescent. Turn left at end of street, up carpark ramp. 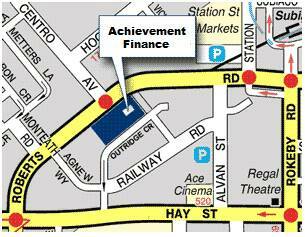 There are free parking bays available marked Prospera Partners. Enter via ground floor lobby into elevators and up to level 1 or via Roberts Road taking the stairs to level 1. We are located in suite B9, Level 1, 431 Roberts Rd Subiaco in the Tempo Offices with Prospera Partners.